A random shopping trip – yes, grocery shopping. Is there any other kind? – in Paddock Wood, which was intended to be only for those food stuffs which would facilitate the hour plus train ride home from a wedding the previous day, saw me purchasing green garlic, pak choi (see previous post) and lemongrass. The lemongrass is the star of this dish, but I will say that the green garlic has a lovely fresh bite and is a million times easier to peel than the regular garlic you find in the store and it lasts longer than you think – mine is a week and a half in and still seems to be firm and fresh. Anyway, back to the lemongrass! Lemongrass is something I haven’t cooked with very often, usually using it to flavor broths or blitzing it up into a curry paste of some description – although now that I’ve watched Rick Stein’s India, I feel sort of silly even saying the word ‘curry’. I figured that it would work in the same way to flavor the liquid the lentils are cooked in as it would for a broth, so then I started wondering what else I could put in the lentils to complement this Asian vibe. I happened across a recipe online for lentils with coconut milk, which was obviously an act of fate, and things started to fall into place. Salmon was a natural accompaniment to these creamy, spicy lentils – yes, meat and fish can accompany vegetables. No really, they can. Salmon and lentils are a well known combination and we all know that salmon works extremely well with Asian flavors – although, I’m beginning to wonder if there is anything that doesn’t work with Asian flavors, see Honey, Sesame and Chilli Potatoes. 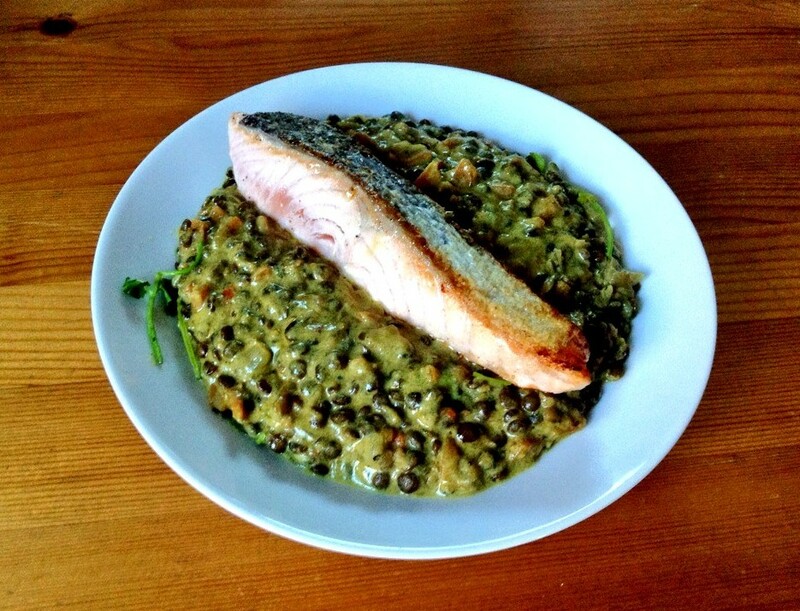 Crispy skin and tender, moist chunks of salmon all sitting atop creamy lentils. The freshness of the lemongrass and a chilli kick means that no mouthful is cloying; the chilli and lemongrass almost cleanse your palate after each bite, leaving you ready to fully enjoy the next. And it’s full of protein, omega 3, vitamin A, all sorts of good things! Go try it, you’ll never see lentils in the same light again. 1. Heat oil in a large shallow pan over medium heat. 2. Add onions and sauté until translucent, about 5 minutes. 3. Add carrots, garlic, ginger, chilli and lemongrass and sauté for a further minute. 4. Add celery and mustard seeds. 5. Add remaining spices and cook for a further 1-2 minutes. 6. Add lentils, stir to coat and then add stock or water. Bring to a boil and reduce to a simmer. 7. Simmer 45 minutes or until lentils are tender and most of the liquid has been absorbed. 8. Add coconut milk and continue to cook until the lentils achieve the consistency you want. I cooked mine for another 10 minutes or so until they were the consistency of risotto, oozy but not runny. 9. When the lentils look like they’re a few minutes away from being finished, heat some butter over medium high heat in a small frying pan. 10. When the pan is very hot, add the salmon skin side down and cook for 3-4 minutes or until the skin is brown and crispy. 11. Turn the salmon over gently and cook on the other side for a further 3-4 minutes (longer if you like your fish well done, but not longer than about 5 minutes per side for a fillet about one to two inches thick). 12. Sit the salmon atop the lentils and sprinkle with cilantro (coriander). Thanks! It was very tasty and so much more luxurious than the sum of its parts! Yeah, I changed that this morning which is why the link in the emails was wrong. I was obviously feeling very ‘friendly’ when I wrote the post! nevermind, you already fixed it. An unusual combination, but it looks delicious. It really worked well. Will definitely be doing it again! 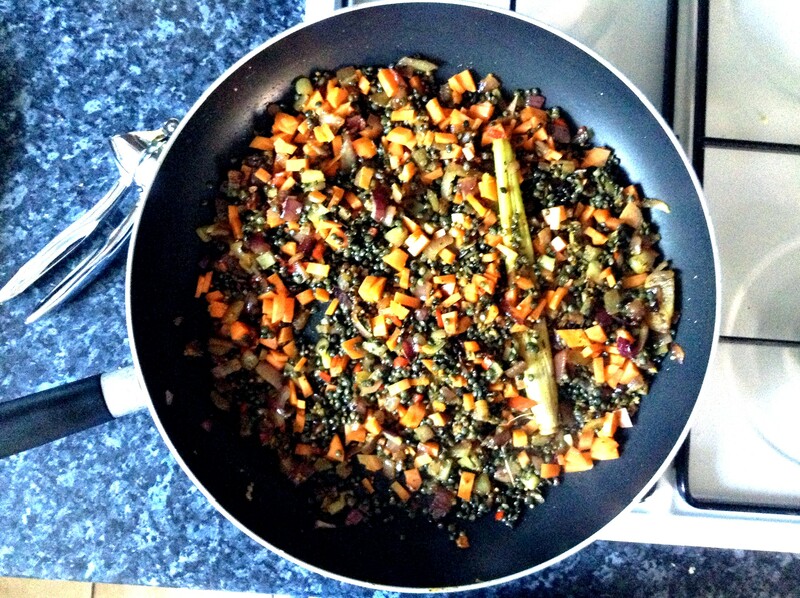 I love the sound of coconut and lemongrass lentils! 3 things I love, would be lush with some marinated grilled tempeh on top! Yeah, the lentils could definitely be the basis of a vegetarian or vegan meal (coconut milk doesn’t have any dairy right? ), they are delicious enough to hold their own!